Please note that each individual graduate program offered through the Department of Special Education has a unique set of program application requirements and application deadlines. Visit your graduate program web page for additional details: sped.ku.edu/degrees. The Department of Special Education allows a maximum of six credit hours to be transferred into a M.S.E program in accordance with allowable rules of transfer credit. Transferred credits are not guaranteed to be applied to program requirements. 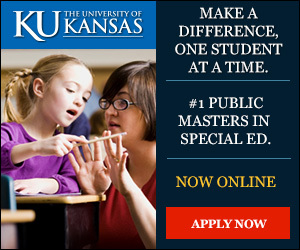 Graduate students are encouraged to apply for admission to the Department of Special Education's online graduate certificates and online Master’s degree programs through the Office of Graduate Studies: graduate.ku.edu/apply. Graduate students interested in applying to the Department of Special Education at the Edwards Campus in Overland Park are encouraged to apply for admission through the Office of Graduate Studies at the University of Kansas: graduate.ku.edu/apply. Once admitted to the University of Kansas as a freshman student, all pre-teacher education majors will be advised and invited to apply for admission to an undergraduate professional teacher education program. Once admitted to the University of Kansas, all pre-teacher education majors will be advised and invited to apply for admission to an undergraduate professional teacher education program. Individuals interseted in completing coursework without the intent to complete a degree program are encouraged to apply as non-degree students. For more information, please contact the Department of Special Education at specialeduadm@ku.edu.